Samuelson-Glushko Technology Law & Policy Clinic (TLPC) – Student-run public interest technology law and policy advocacy at Colorado Law. 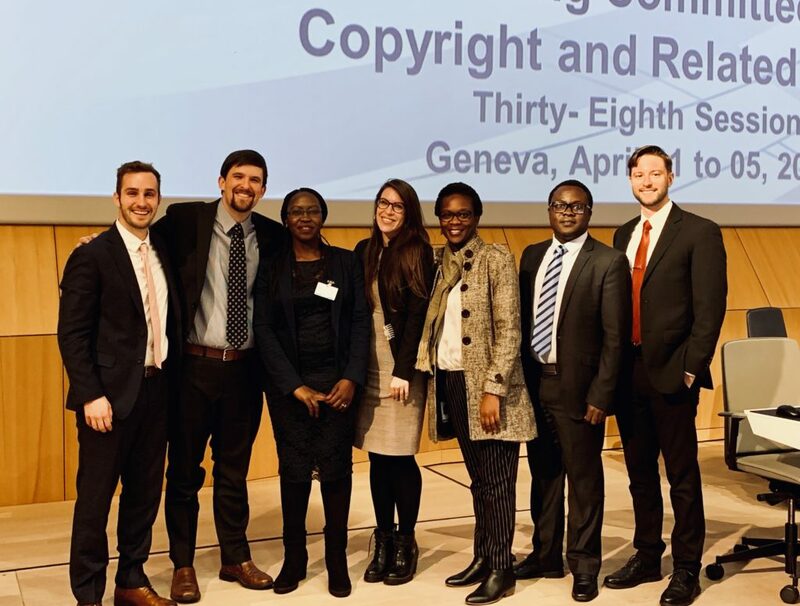 TLPC student attorneys Colleen McCroskey, Kevin Doss, and John Schoppert, along with TLPC Director Blake Reid and colleagues from the University of Cape Town, including Prof. Caroline Ncube recently presented to the Standing Committee on Copyright and Related Rights (SCCR) of the World Intellectual Property Organization (WIPO) on the intersection of copyright law and disability. University of Colorado aerospace engineering Professor Scott Palo and the TLPC have filed comments before the Federal Communication Commission regarding the Commission’s orbital debris mitigation policies. The TLPC asked the Commission to adopt regulations that effectively mitigate the buildup of orbital debris in coveted orbits while preserving access to orbits that are important to university-led missions. Today, the TLPC filed a response on behalf of its client, Telecommunications for the Deaf and Hard of Hearing, Inc. (TDI), and a coalition of disability consumer organizations and researchers to a petition from General Motors seeking a waiver of certain FCC rules for its forthcoming ride-hailing service. The petition awaits action by the FCC. The following analysis was written by Harrison Grant and Brian Trinh of UCI Intellectual Property, Arts, and Technology Clinic and Colleen McCroskey and Corian Zacher of Samuelson-Glushko Technology Law & Policy Clinic at Colorado Law, under the supervision of Professors Jack Lerner and Blake Reid. Authors Alliance is grateful to the student attorneys and their supervisors for their tireless work securing exemptions to Section 1201 for authors and for this careful analysis of the results of recent rulemaking proceedings related to multimedia e-books. On October 26th, the Library of Congress announced important new exemptions to Section 1201 of the Digital Millennium Copyright Act (DMCA) that will improve authors’ ability to create in the digital environment. Thanks to the work of a coalition of authors’ organizations including Authors Alliance and two law clinics who represented them, today authors of any non-fiction multimedia e-book can use content from DVDs, Blu-ray, and digitally transmitted video to make fair uses of copyrighted material in their own works. In 2017-2018, the TLPC, including student attorneys Sophia Galleher and John Schoppert, represented the Association of Transcribers and Speech-to-Text Providers (ATSP) before the U.S. Copyright Office’s Seventh Triennial Section 1201 Proceeding in Washington, DC. in an effort to empower disability services professionals to circumvent technological protections measures (TPMs) to provide accessible captioned and described video to students with disabilities . To do so, the Clinic argued in comments and at the hearing that accessibility purposes were quintessential fair uses and should be the subject of an exemption from liability under Section 1201 of the Digital Millennium Copyright Act. In late October 2018, the Copyright Office issued its Recommendation and the Librarian of Congress implemented final rules shortly thereafter, largely granting ATSP’s request, as summarized below. The TLPC, along with the the American Foundation for the Blind (AFB), the American Council of the Blind (ACB), and the Library Copyright Alliance (LCA), recently recorded a win for the print-disabled community via a successful proposal for the renewal of an exemption to Section 1201 of the Digital Millennium Copyright Act (DMCA). Today, TLPC student attorneys Nate Bartell, Elliott Browning, and Zachary DeFelice filed comments in the National Telecommunications and Information Administration’s new docket on consumer privacy on behalf of twenty-one privacy law scholars, led by Colorado Law Prof. Margot Kaminski. Today, the TLPC filed long-form comments before the Federal Communications Commission on behalf of the Hearing Loss Association of America (HLAA), our client Telecommunications for the Deaf and Hard of Hearing, Inc. (TDI), and a coalition of consumer groups and accessibility researchers. The Commission is considering updates and changes to the IP CTS program, which millions of Americans who are hard of hearing, deaf, and DeafBlind rely on to communicate on equal terms. Update (Oct. 16): we’ve now filed two additional sets of comments, linked below. Update (Nov. 15): we’ve filed a final set of reply comments, linked below. The Internet has opened up the opportunity for creators to reach worldwide audiences. Authors can transmit digital creations in a matter of seconds by simply uploading an article or ebook, sharing a video, or posting a blog entry. But authors can reach an even wider audience if their digital creations are accessible to those with disabilities. Notwithstanding significant strides made toward making digital content more accessible over the past decade, the prevalence of inaccessible digital content continues to be problematic. Last fall, Authors Alliance, the Silicon Flatirons Center, and the Berkeley Center for Law and Technology convened a group of content creators, technologists, attorneys, academics, and advocates to discuss the role of creators in making digital works more widely accessible to people with disabilities, reported by TLPC student attorneys. The roundtable discussion focused on the unique role authors, educators, and libraries play in making digital works accessible; the benefits, obligations, and barriers around accessibility; the availability of authoring tools that facilitate accessibility; and the gaps for digital accessibility that technology and policy might fill. That conversation led to the creation of the report, Authorship and Accessibility in the Digital Age, which distills these topics into a concise summary of the current landscape, as well as recommendations for further action. We gratefully acknowledge the support of Authors Alliance, Silicon Flatirons Center and the Berkeley Center for Law and Technology in making the roundtable and the report possible. We also thank Angel Antkers, Susan Miller, and Sophia Galleher, student attorneys in the TLPC, for their role in authoring this report; and Rob Haverty at Adobe Document Cloud for his assistance in creating an accessible PDF.